Ever since Hide-Chan's Ramen left Shirokiya, I've found their different ramen stands to all blend together. They've become very repetitive, and seem to all have the same flavor- either regular pork broth, miso broth, red broth (spicy), or black garlic. All same same. This time, though, I'm happy to report that Shirokiya's ramen stand, Kohmen from Tokyo, offers a different taste. Instead of the usual milky pork broth, they serve their popular Pig Bone Broth with shoyu. It has a more pungent, salty taste. It's not a light milky-brown color, not bland at all, and the toppings are different. The first few ramen shops that were at Shirokiya all offered ramen topped with chashu and onions seen here, here and here. 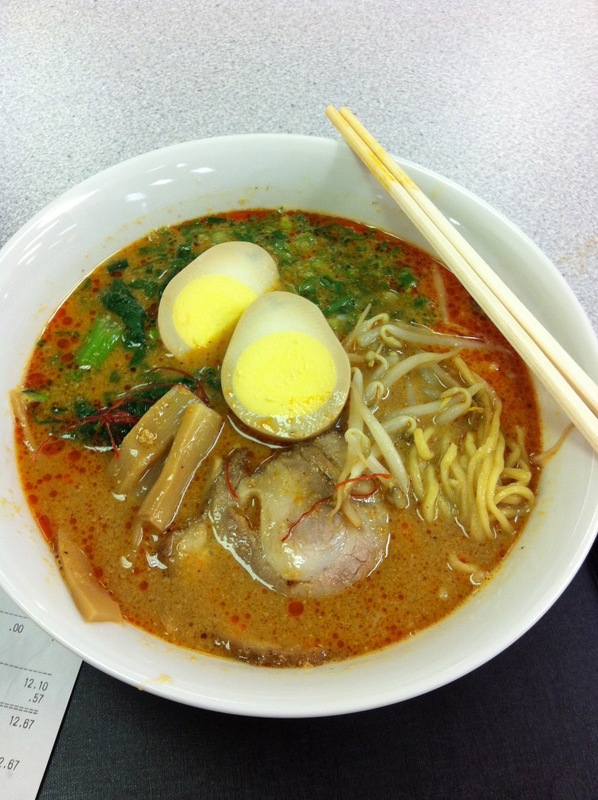 However Kohmen offers more menu options- ramen with one slice of chashu,/nori or with one slice chashu/green veggies/nori/and one hard boiled egg cut in half, or with all toppings which include slices of chashu/nori/half a hard boiled egg/bamboo shoots/green veggies and bean sprouts. Prices are more reasonable as well. The ramen with all toppings is less than $11! What I also really like about Kohmen is their service. They are so much more approachable, and really want to cater to you and make sure you had a great meal. Kohmen's staff was friendly, made a batch of fresh, hot gyoza and served it as samples. I couldn't reach any to sample, so a staff member came over to let me grab one. Tasty, chunky and was so delicious I didn't even need the dipping sauce! Even when I had finished my bowl of ramen, one of the workers came over to ask how I enjoyed it and if I was done. After replying with an ecstatic "yes!" he proceeded to take my trash and bowl away. What service!! I love Kohmen!! I can't wait to go back and try their Szechuan-Style Sesame Hot Noodle!! broth. Very, very good. I think they called it Tan Tan, when I went there last, but is that really Tan Tan?? Hmmm...who cares, it's good, and you have to try it! Their #2- I only wish their eggs were like the menu picture- not fully cooked, yolk a little more orange, soft and runny.